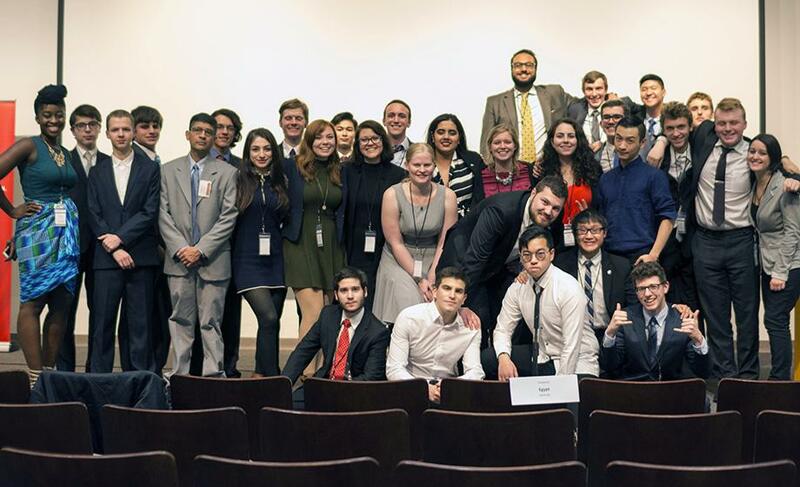 Add another accolade to Clark University’s decorated Model United Nations team. Clark’s travel team now ranks among the top five in New England, according to annual fall rankings published by Best Delegate, a website dedicated to the Model U.N. experience. The travel team that participated in the Columbia Model United Nations in New York. From left, Corie Welch ’17, Brendan Burgess ’18, Conor Mulqueen ’19, August Welles ’19 and Alex Chilton ‘20. 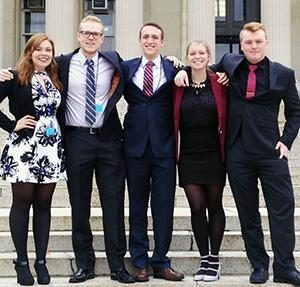 Clark’s MUN travel team competes at eight conferences each academic year. This fall, the team performed well at four conferences — held at Boston University, Columbia University, the University of Pennsylvania and Georgetown University — under the leadership of Head Delegates Corie Welch ’17 and Brendan Burgess ’18. “This latest piece of news — that ours is among the very best teams in the region and on the continent for that matter — is a truly fantastic way to wrap up what has been a great semester for us,” said Burgess, a double major in political science and computer science. The team’s hard work over the past four years propelled it to a No. 17 ranking on Best Delegate’s 2015-16 North American Colleges final list — higher than teams from Princeton University and American University. Competing is only one way to participate in MUN. Clark also hosts its own annual fall conference for high school students and a spring conference for middle school students. 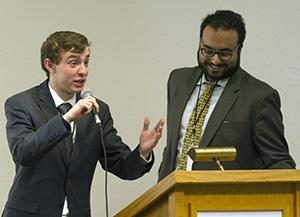 This year’s high school conference, ClarkMUN VII, drew hundreds of students from around the Northeast to campus in November, with alumna Sarah Richard ’11 returning as the keynote speaker. First-year student Matthew Gerstein ’20, a political science major with a minor in history, is an under-secretary-general for ClarkMUN VII. He notes that Model U.N. was “one of the primary reasons” that he came to Clark University. This summer, three of Clark’s Model U.N. members — Dea Dodi ’17, Arslan Tarar ’18 and Absar Ali ’18 — took their skills into the diplomatic world, holding internships with the United Nations. The team is supported with funding from Clark University Student Council and the Department of Political Science. Srini Sitaraman, associate professor of political science, serves as the team’s faculty advisor. MUN at Clark is planning to send travel teams to four spring conferences organized by McGill University, Harvard, Brown and Mount Holyoke College. The team’s travel schedule may expand to 10 conferences per academic year if the team adds New York University’s and Yale’s conferences next fall.